Today's the last day before we move on to the next Movie Night feature, so I thought I'd add a couple screenshots from Umi Ga Kikoeru. There are a lot of terrific shots to choose from, but I'm always a sucker for good composition, so here's one from the airport scene. 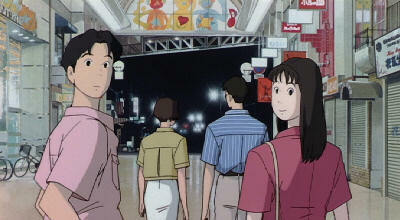 The other shot comes from the class reunion; note the attention to detail in the shopping mall in the background. 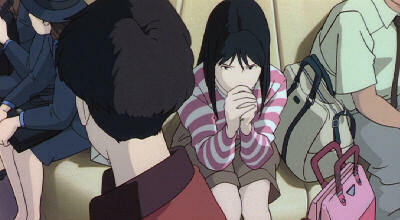 Like many Ghibli films, this is based on an actual location, and the accuracy in the detail is striking. Also, it must be said. I miss the good ol' days of hand-painted animation. Today's computers have many advantages, but they still cannot match that unique quality that only comes from using a paintbrush. Poor Michiyo Yasuda must have cried buckets when they took all the paints away from the Ink & Paint Dept. and replaced them with computers. I'm a big fan of hand painted cels as well. I suppose computer coloring can be decent but I love the look of older animation and it's color. The digital age of hand drawn animation just didn't make sense to me in the late 90's, early 2000's. It was like leaning towards computer animation but not making the jump. All the while taking out a bit of what makes hand drawn so damn appealing. If you're going to have an industry with 2 different tools for animation, I think it's important to make them as different and unique to the qualities each tool offers as you can. Not show a bias towards one by pushing the other closer to it. It could never be computer animation and that's what felt cheap about it. Also a reason why Lilo and Stitch had a good following imo as well, with it's watercolor backrounds and specific hand drawn qualities being stressed. Unfortunately I felt the alien chase brought the film down; leading to something that was setup to be, but couldn't be as effective as My Neighbor Totoro's sister story.